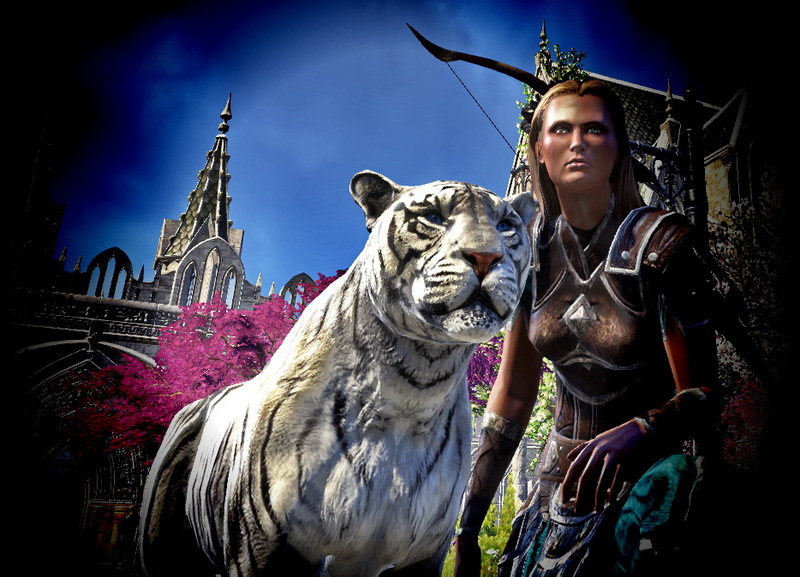 A Colovian Imperial, journeying across Tamriel with naught but small coin and the companionship of beasts; her story is a curious one, but one which has many chapters with the ending yet to be written. Raesa Arcavius is a friendly passerby with a lending hand to any who may need it; selfless and true, she and her silver-coated tigress named Qila (kee-la) welcome any chance to aid a stranger, in exchange for a warm bed and a decent meal for the night to come. With a slightly bronzed complexion and an umber, cropped mane of hair tumbling to the nape of her neck, Raesa comes across as just another, average Imperial. Upon closer inspection, the woman appears to be bedecked in rough leather - a myriad of browns and greens melded flawlessly together to create a near-perfect forest camouflage, complete with a simple bow and a quiver slung over her shoulder; used to her advantage when her stomach rumbles. Lacking the expertise of most, military-raised kin the traveller still has some improvements to make, but that's not to say she's a terrible shot. At most, she's adequate enough to survive the wilds and any potential, untrained muggers which may try their luck. The nomad stands at a delicate height of 5.5ft (167cm), aiding her in staying low to the ground when required - such as those long nights without a meal bought at the local inn, hair brushed back and clipped aside to keep her fringe away from her ocean-blue eyes. Travelling by foot or horse, she can often be seen in the company of her feline partner, or her current steed: An appaloosa-paint mare. She and the mare have been together since near the day she left, obtained as a thanks for helping a poor soul over a period of days, too ill-equipped to look after her, himself. Calm and collected, the horse has been an esteemed companion over the years, their bond growing quickly. While she never found herself to be an animal-lover, Raesa soon found her secret love, basking in both the companionship and the swift-foot that the mare gave. Quila and Raesa came across one another in an unfortunate event. Stumbling too close to the resting place of Quila and her mother, the Imperial was victim of an attack; it was only after the tigress had been downed that Raesa heard the mewls of a much larger problem in a younger form. Too young to tend for herself, Quila was taken in by the traveller, raised to be a faithful and gentle companion.The two have been inseparable since. Raesa as a person is honest, loyal and lawful. Unafraid of hard-work, Raesa is one who puts everything into the task - be it labour in the fields, or the menial task of picking plant-life. Enjoying an uncomplicated life, she fled the life of luxury and expectations to be her own person - preferring the company of herself and like-minded individuals than the unforgiving upbringing from that of her parents. She is, however, by no means of noble-birth - brought up in a middle-class setting, the expectations of an Imperial are still high; one must speak properly, and uphold the family name to remain in the status of marginal wealth through successful trade, alone. A bad reputation is a poor one. Despite leaving home, family is important to Raesa. If she speaks of home, she speaks of it in a fond manner - tales of her childhood and rebellions she took part in are never far away from her lips, yet her stubbornness remains true; outright refusals of returning accompany the stories she tells, the strict and narrow-path being the type of life she wishes to escape. The Imperial woman has a sense of humour, though it may not always be appropriate, or appreciated. She can be brash, and brutally honest while still somehow maintaining a delicate charm, or wit. She's quick to befriend others, seeking solace in the company of others' in the brief moments she has under the comfort of a roof, before the cruel outdoors clutch its cold claws around her shoulders, once more. Travel-wise; Raesa has been on the road long enough to have a knack for directions and tracking. Lithe and Small; Being a modest 5ft 5(167cm), Raesa is small enough to squeeze into tight spaces and stay low to the ground; ideal for scouting, tracking and hunting her meals, or hiding from would-be-foes. Eye of the Tigress; Quila and Raesa have a strong bond. 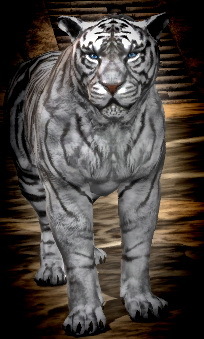 Quila's nose and eyes are Rae's, the tigress able to alert her Human companion of any dangers that may lurk, as well as being a formidable asset in combat. Light-footed; Raesa can be swift when needed, having the agility and dexterity to clamber and climb up and down the terrain to gain a better vantage point. Imperial Upbringing; Being brought up in the life of an Imperial means Raesa has some mild understanding of combat. She may not be very good at it, however... Or experienced. Inexperienced; Raesa hasn't had the taste of true combat, save for a couple of scraps with rowdy bar-goers, or the occasional bandit on the road. She's willing to learn, however! Spacious Pouches; Living on the road is tough; no long in the safety-net of her family, Raesa relies on simple favours and jobs to keep her pockets tinkling with coin. It can often result in sleeping rough, or in the hay-mounds of stables. Magical Malady; The Colovian woman isn't a fan of magic! While she won't make an issue out of magical affinity, she may be quick to refuse magical treatment; in the event of her life being endangered, force may be required to give adequate magical healing. Lacklustre Strength; Agile she may be, a hero she is not. Raesa has forgone any in-depth training in strength, meaning that taller and stronger enemies may be able to easily overpower her if she's too slow to dodge or evade. Imponderous, leather threads; Raesa travels light - her accoutrements fitted to enable easy movement without being impeded, while still offering basic protection. Bow & Arrows; A longbow and quiver, slung over her shoulder, and within easy reach. Coin Pouch; Tied securely along her belt. Water-Skin; Filled with water, always prepared for the road. Satchel/Knapsack; Filled with crudely drawn maps of the areas she's trekked, a spare water-skin and dried rations of food. Knife; sheathed at her belt.